Keep your shoes dry and smelling great. Simply place the shoe dogs in your shoes overnight and they will absorb all sweat and moisture, leaving a fresh cedar smell. The medically treated cedar dust also destroys bacteria and fungus buildup. A handy polyester strap keeps them together. Simply place the shoe dogs in your shoes overnight and they will absorb all sweat and moisture, leaving a fresh cedar smell. This product works. Dries sweaty shoes; removes odor; prevents bacteria and fungus buildup. Leaves a nice smelling odor on your shoes. I have two kids who play soccer all year. Their boots (cleats) are very expensive & made of soft leather. Shoe dogs are the BEST for drying out their boots nightly. They help retain the cleat form, extend the cleat life, and also remove the nasty odor. My husband and I both use shoe dogs in our exercise/running shoes. THEY LAST A COUPLE YEARS AND WORK AWESOME!! The shoe dogs gets the job done when you put them in your shoes. It's been a few months and these things are still smelling great. 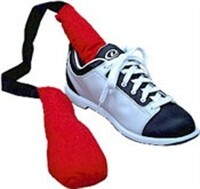 Deodorizes the odor on your shoes after you played a few games. By Red from Anderson S.C. I would buy the shoe dogs again. They are the best thing I found so far to keep the smell out of my shoes and my bag. Seem to be keeping my bowling shoes fresh smelling and dry so far. Unfortunately, these are not washable. Due to the time it takes to produce the Shoe Dogs ball it will ship in immediately. We cannot ship this ball outside the United States.